A natural sounding digital/analog delay, with the analog direct signal path. Hand-made in Finland premium quality delay pedal. Deep Blue Delay is a natural sounding digital/analog delay, with the analog direct signal path. The Deep Blue Delay has about the same bandwidth as the classic tape echo units, and it can be used in front of an amplifier or in amplifier effects loops. There are no noise reduction circuits, which keeps decay of echo as natural as possible. The direct signal path is short and made with analog amplifiers with no filtering. There should be no distortion or tone coloration as long as input level is in the range below maximum allowed. The echo signal has a tuned filtering to allow extreme settings without interference. The delay is specially designed to work well with distorted tone, as this is the most critical application, where delays often fail. You can use the pedal before or after distortion. As such, it will work exceptionally well on clean sounds where requirements are less stringent, especially in terms of echo bandwidth and repeat formation. The delay tone has been carefully tuned with a lot of attention to the first critical reflection and how the repeats decay. 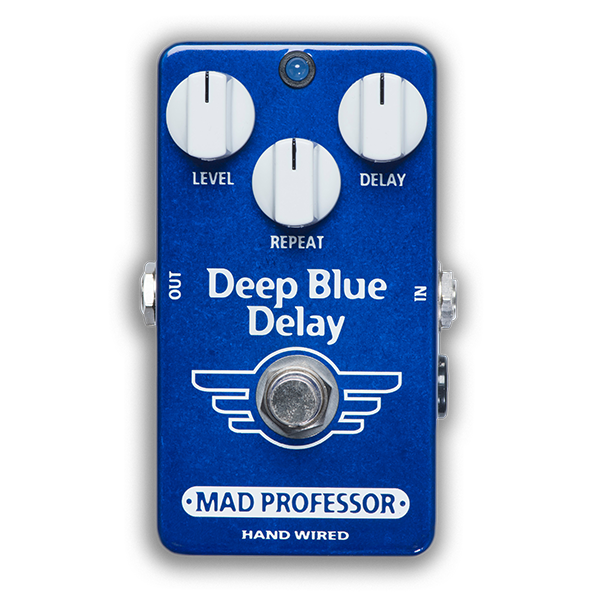 Deep Blue Delay is kept small (Width x Length x Height: 69mm x 111mm x 50mm including jacks and knobs) containing just the basic delay features; Delay Time, Delay Level and Repeat controls. It was designed to work as an ambiance delay; like that of a vintage tape echo and the repeat, the formation was specifically designed to allow easy setting and less critical setting of delay time. With delay times higher than 120ms, the delay time is sometimes set on the beat or on a multiple of the beat. Deep blue handles this by not giving full range repeats, but a tuned response that doesn't need to be on the beat to sound good. Why digital? Isn’t Analog better for a solid-state solution? Well, in many ways, the delay medium is less critical and it could be an oil-drum, tape, metal-thread, analog BBD or digital, but the final sound is always set by the limitations of the delay medium and the peripheral circuitry needed to make either work. We chose Digital construction to make it compact, stable, with reasonable delay time and virtually service free, where the limitations of the circuit would be less critical. As an outcome, you can set the peripheral circuitry with desired bandwidth and distortion levels with less consideration on the exact limits of the delay medium, while of course always pushing the limits, as with anything musical. A similar circuit in analog form would be excessively more expensive to make. For the same performance, it would require three to four of the best BBD chips now only available as vintage parts and the size of the pedal would have to be about three times the current size. CONTROLS LEVEL: Sets the level of delayed signal mixed with straight guitar tone, fully CCW there is only straight (un-effected) guitar signal heard and fully CW gives the loudest delay. DELAY: Controls the delay time from 25ms (fully CCW) to 450ms (fully CW). REPEAT: Controls the repeats of the delay signal, fully CCW gives one repeat and at fully CW you get infinite feedback. ELECTRICAL SPECIFICATIONS Current consumption: 32mA at 9VDC Voltage range: 8V to 15V (below 7.5V delay signal will be muted) Input impedance: IZ 180K ohms Output drive capability: 10K ohms Maximum input voltage: 2V peak 650 mV rms Signal to noise ratio: 80 dB Delay time approximately 25 ms to 450 ms Power requirement supplied via 2.1 mm DC socket Input and output connections via 1/4” phone jack Complete bypass and input of circuit grounded when in bypass POWER REQUIREMENTS 6F22 9V battery or DC eliminator 2.1 mm plug center negative and positive sleeve.